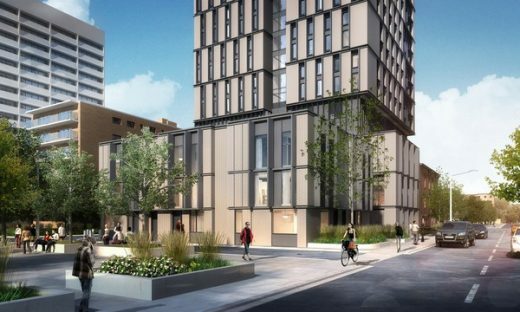 August 14, 2018, TORONTO – The first new student residence to rise at University of Toronto’s downtown St. George campus in a decade has reached a development milestone. 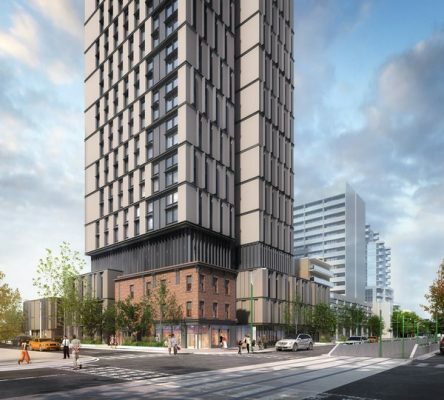 U of T said an agreement with the city and local community groups has been struck for the 23-storey building at the corner of Spadina and Sussex Avenues. 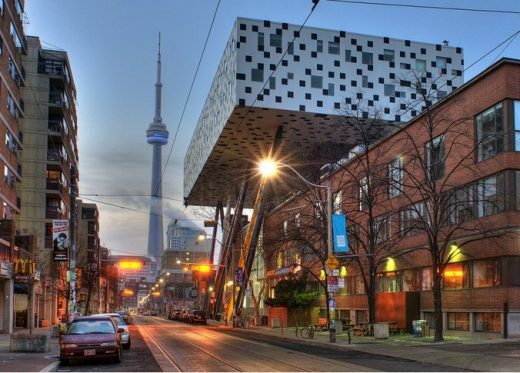 Designed by Diamond Schmitt Architects, the residence addresses an urgent need for more student accommodation while providing community amenities as part of the design. 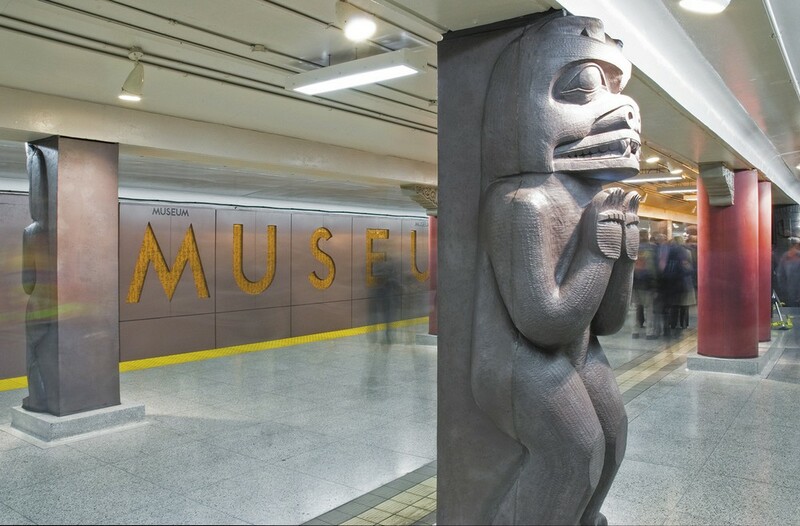 A three-storey heritage building will be incorporated into the façade and a public green space will be added to the site. The slender brick-clad tower will house 511 students in a bright, airy structure that mixes modern residence spaces with lively retail storefronts. “We wanted to find the place where U of T’s obligation to students overlaps with the broader community’s interests so it’s a successful project in both the university and public realms,” said Scott Maybury, U of T’s vice-president of university operations. Student common areas include study space, a music practice room, fitness studio and project room on the mezzanine level. 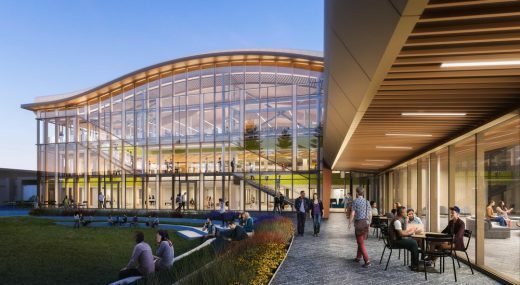 Two dining halls and a multipurpose event space will occupy the second floor. The adjacent Robert Street Field, used by U of T’s Faculty of Kinesiology & Physical Education, will be rejuvenated for community and school use. 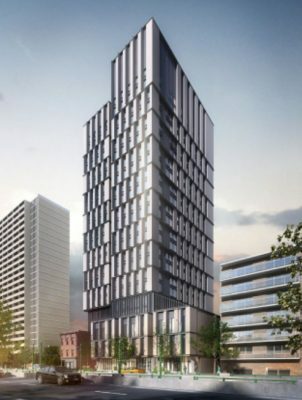 The Spadina-Sussex Residence is a partnership between U of T and developer The Daniels Corp., for whom Diamond Schmitt has designed condominiums Paintbox and High Park as well as Daniels Spectrum, an arts and learning centre in Toronto’s Regent Park. 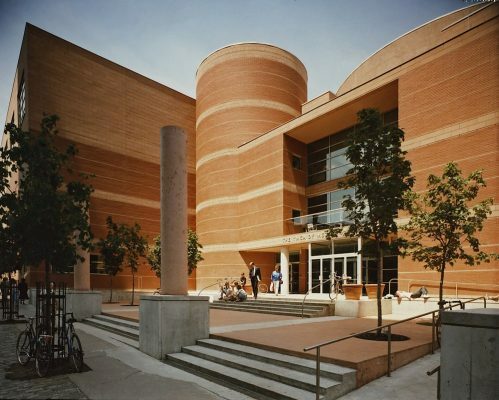 The University’s plan is to create housing on the main downtown campus for 2,300 additional students by 2020.